Salve a tutti. Eccomi con un nuovo outfit da mostrarvi. Il freddo è arrivato e di conseguenza anche tutto l’abbigliamento invernale finalmente potrà essere indossato. Come vedete ai piedi indosso degli UGG panna super caldissimi, comodissimi e bellissimi …eh si le qualità le hanno tutte per loro. Ho scelto di indossarli con un semplice jeans e un maglione in lana con queste labbra disegnate su un lato. Un look comodo, veloce e casual allo stesso tempo. Ormai avrete imparato a conoscermi noh? Cambio look a seconda del mio umore e della mia voglia di ispirazione. Un abbraccio….al prossimo post !! Hi all. Here I am with a new outfit to show you. The cold has arrived and, consequently, all the winter clothing can finally be worn. As you can see at the foot of wearing UGG cream super very hot, beautiful and very comfortable … oh yes they all have the qualities to them. 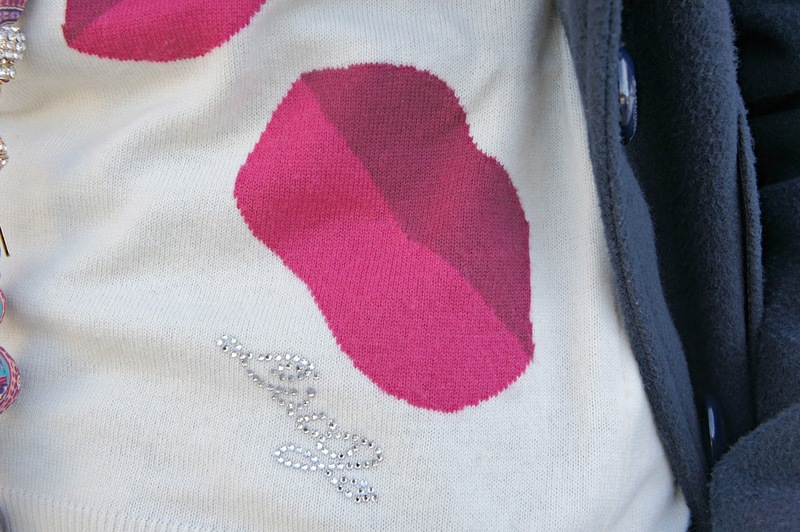 I chose to wear a simple jeans and a sweater wool with these lips drawn on one side. For a comfortable, quick and casual at the same time. By now you have learned to know noh? Change look depending on my mood and my desire for inspiration. A hug …. the next post! stupenda! adoro quest look stai benissimo! passa da me, mi farebbe molto piacere! Thanks for the love hon, I’m following you now! love the whole outfit and the boots is super cute! You look stunning:-) Impressive blog! Thank you! Now I follow you!